April 2016 : Voted best Candy Store and Best Specialty Gift Store by the readers of the Conway Daily Sun. Mar - 2006: Selected as the Retailer of the Year by Pride of New England (New England Gift Show). This selection is made through voting by the vendor trade. Considered among the finest community partners in Mt Washington Valley, Zeb’s donates approximately 100 gift baskets to various fund raising functions every year. Yet, even more impressive is the Zeb’s Charitable Fund, a unique fundraising arm unparalleled by other New England retailers. Established in 2007, the intent of Zeb’s General Store Charitable Fund is to grow principal while making cash contributions to various organizations serving the needs of children in the Mt. Washington Valley. Accordingly, the store matches all contributions made from the fund each year plus adds $10,000 yearly to assure future funding for children’s causes. Since its inception in 2007, the Zeb's Charitable Fund as awarded $13,500 in grants to youth causes while the business has placed an additional $40,000 into the fund over the past four years. 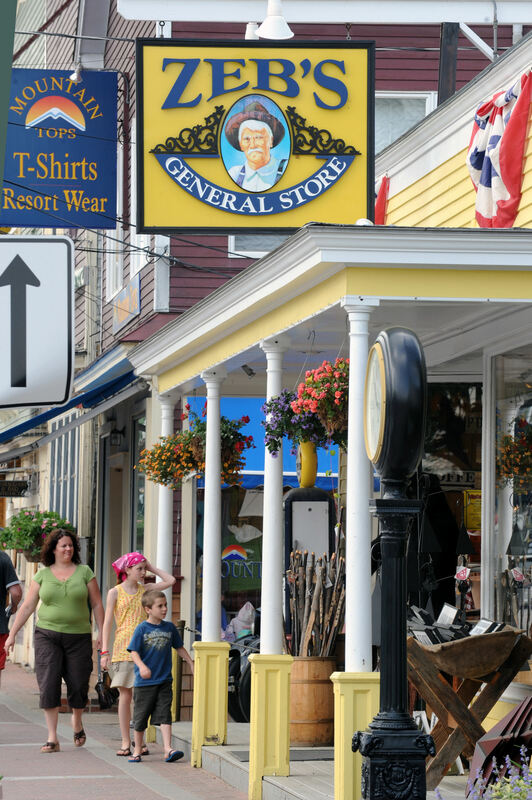 Zeb’s General Store is a virtual emporium of creativity from the largest collection of New England made specialty foods to soaps, lotions, books, toys, pet items, artwork and photography and more. If it’s New England made, you’re bound to find it here. Try as you might, it’s tough to come away from Zeb’s General Store without one or more items. From the old-fashioned Coca Cola fountain (which the Coca Cola company would give their eye teeth for) to the claw foot bathtubs, penny candy counters and roughhewn wooden shelves, the mission to provide a nostalgic shopping experience is realized at every turn in the store.